Everyone is cooking soup at the moment. It’s exactly what we crave when the temperature plummets. 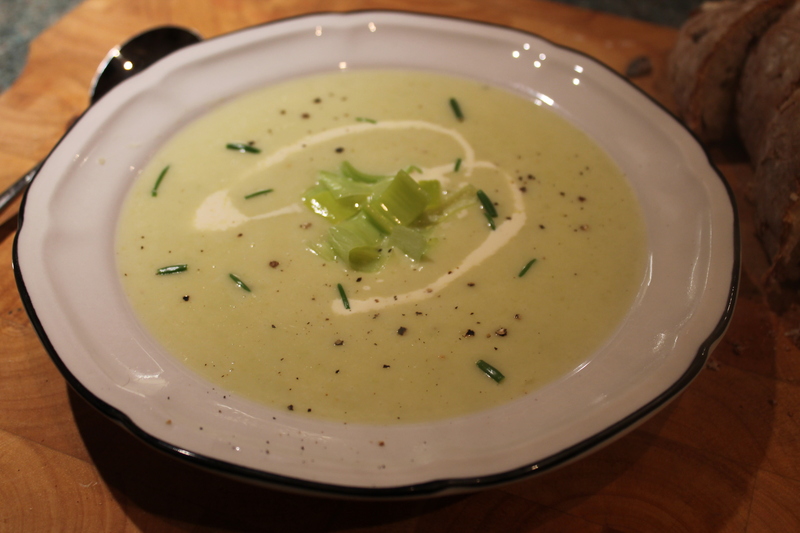 I wanted to make a veggie soup, but also wanted one which is wholesome and filling so, naturally, I went for leek and potato (brocolli and stilton would have been a close second). I’m not going to try to sell this soup as a healthy option – it contains too much butter and cream for that sort of thing. But that’s what makes it so delicious! I think that we must use up so many calories trying to keep warm in this horrid weather that we deserve a little cream sometimes. 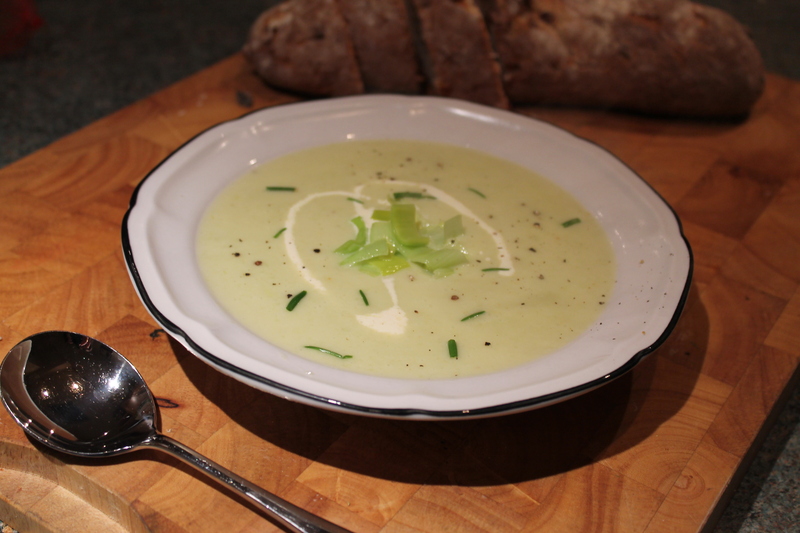 Leek and potato is a classic and will guarantee bowls licked clean. It’s a lovely colour and could easily be prettified for a dinner party. 1. Peel your potatoes and chop them into 1 inch chunks. Trim the ends off the leeks and slice them. Chop your onion into 1 inch chunks. 2. Melt the butter in a large saucepan or casserole dish over a medium heat. When it starts to bubble, and the veg. Turn down the heat and put a lid on. Cook for 5 minutes, stirring fairly often so that the veg doesn’t stick or colour. 3. Pour in the stock and bring to the boil. Put the lid back on and simmer for about 10 minutes, or until the potatoes are soft. 4. Whizz your soup up with a blender until smooth then put back on the heat. Add the cream and milk and bring to a simmer, then season to taste with salt and plenty of black pepper. 5. Serve large bowls or mugs with thick wedges of warm bread. Delicious! I saw a recipe online recently – I don’t remember where – which featured pork chop served with mac ‘n’ cheese on the side. Whenever I make macaroni cheese, I serve it as a main dish by itself (throwing a few veggies in there too to make it a bit healthier – see here). I think this is because the way I usually make it, it takes quite a long time and so I don’t want to over complicate matters. I’ve changed the recipe this time, and I’ve used cream rather than making a bechamel which, although not particularly good for you, is quick, easy and delicious and is surely fine every now and then as a treat. 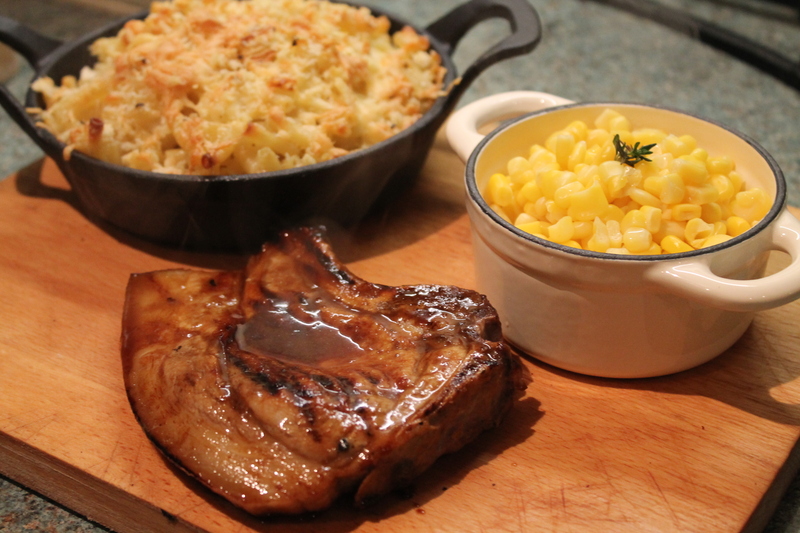 The pork chops are coated in a delicious sweet and spicy marinade which cuts through the mac ‘n’ cheese and, taking inspiration from the USA as this dish does, I decided to serve it with sweetcorn. 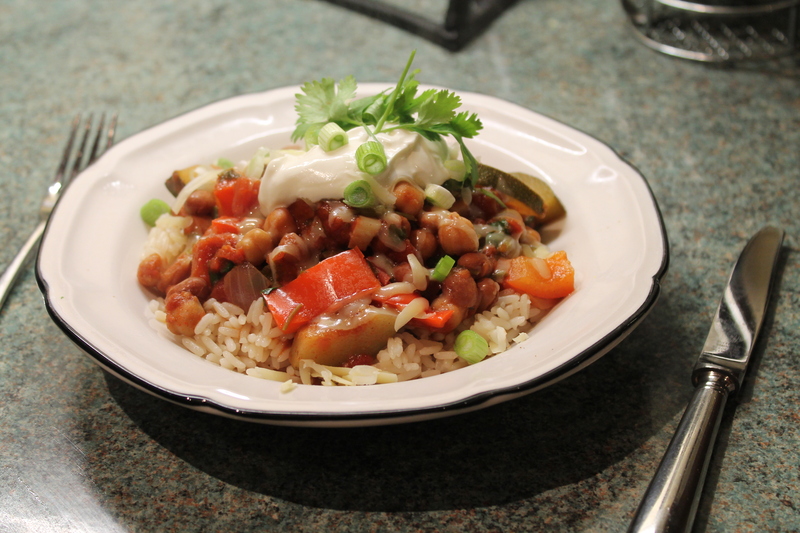 I would have gone for full corn on the cobs, but couldn’t find any in my supermarket – so, a tin had to do and it did the job well! Frozen sweetcorn would be fine too. This is the final of my first series of Cheap Eats – I hope you’ve been enjoying them and welcome any feedback you have! 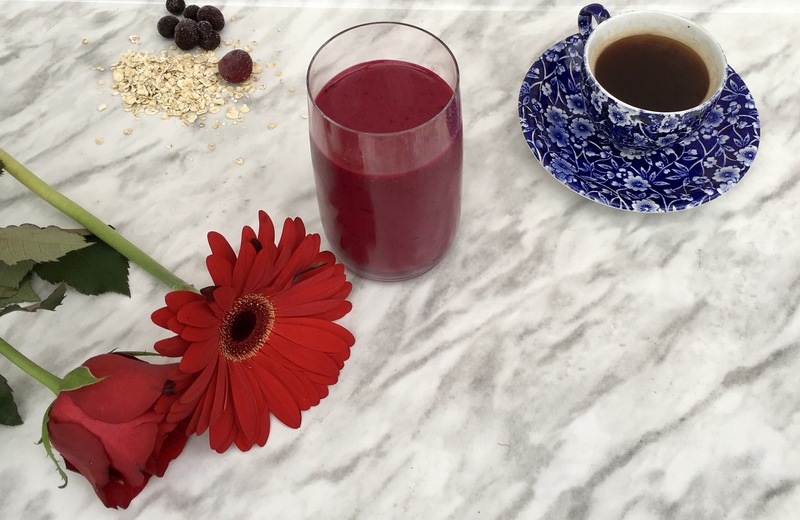 This will serve 2 very greedy people and will take 45 minutes to make. 1. For the pork, mix together the honey, mustard, vinegar and oil in a bowl and drizzle over the pork chops on a plate, making sure they’re well coated. Put them in the fridge while you cook the mac ‘n’ cheese. 2. For the mac ‘n’ cheese, cook the macaroni in a pan of boiling water for 7-8 minutes. Grate the cheese and chop the onion. 3. Drain the macaroni and stir in most of the cheese, cream and onion. Season with salt and pepper, then tip into an oven proof dish. Top with the remaining cheese and the breadcrumbs. Either pop under a hot grill or bake in the oven at 200 degrees until golden and bubbling. 4. For the chops, put a griddle pan on a high heat. When hot, place the pork chops in the pan. 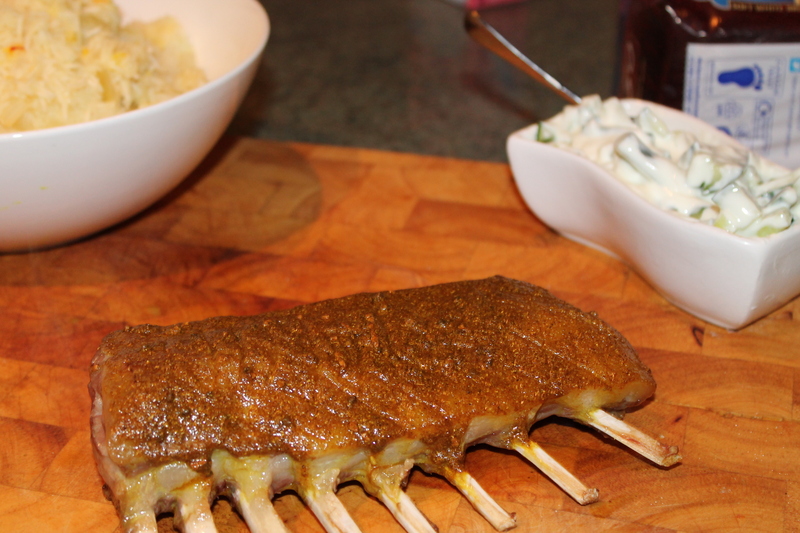 Cook for 3-4 minutes on each side, then tip in any remaining marinade from the plate. Let it boil up, then remove from the heat. 5. 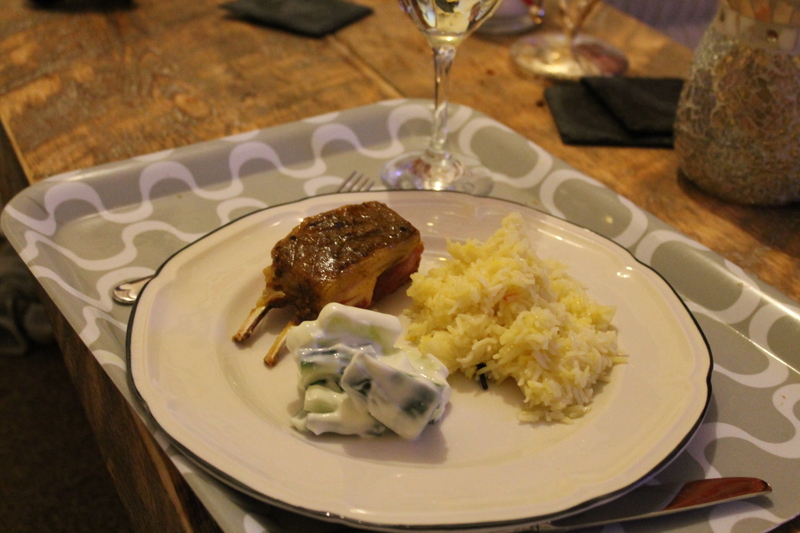 To serve, pop the chops on plates and drizzle over the glaze from the griddle pan. Pile mac ‘n’ cheese and sweetcorn on the side. Delicious! Mussels are in the peak of their season at the moment (in the Northern hemisphere, anyway), so what better time to enjoy them. They’re cheap, and tasty, so pick some up when you next see them. We went for a long walk in the wet and cold today, and what better way to recuperate than with a steaming bowl of mussels cooked in broth. I love mussels cooked any way really, but I prefer the traditional French/English versions where there is a big bowl of moreish sauce to mop up with a doorstep of bread. Some people are squeamish about preparing mussels, but they’re very easy. They take some time, because you want to take care that you’re not eating any that are off, but if you don’t rush them it’s actually quite a relaxing job. I hope you enjoy and if you have any questions about preparing mussels, just comment below. This will take approximately 45 minutes to make and will serve 3-4. 1. 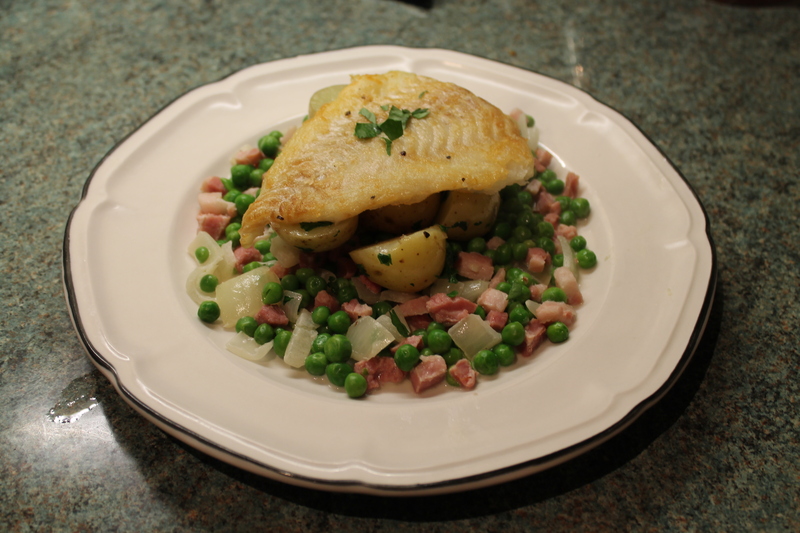 Start by frying the pancetta in a large casserole dish over a high heat. Finely chop the onion, and when the pancetta is starting to turn golden, add the onion to the dish. Turn the heat down and sweat the onion for 2-3 minutes. 2. 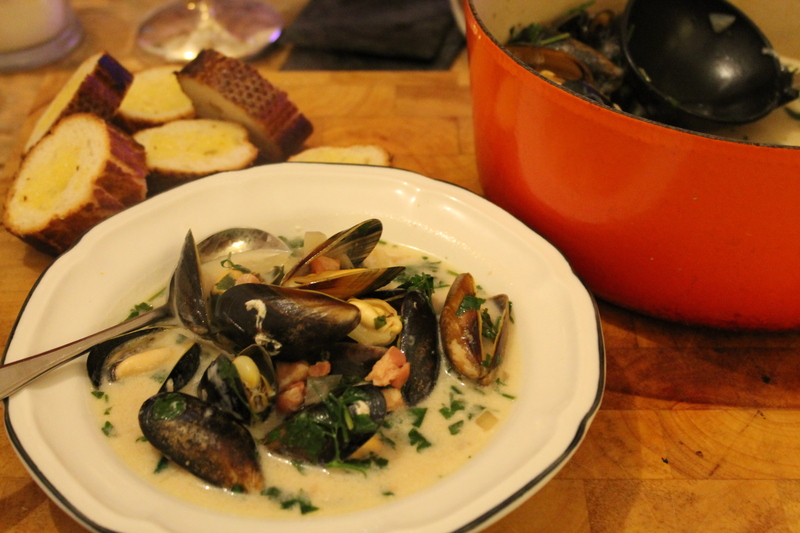 Pour in the cider and 200ml water, turn the heat to low and allow it to simmer while you prepare the mussels. 3. To prepare your mussels, take each mussel from the bag one at a time. If the mussel is closed, pull off the ‘beard’ (the hairy strands which poke out from the shell) and gently scrape off any barnacles. Place in a large colander. If any are open, tap them gently. If they don’t close, discard them. If they close, again remove the beard and add to the colander. If there are any with smashed or cracked shells, discard them. 4. When you have sorted the mussels, rinse the ones in the colander under the tap. 5. Chop the parsley and add it, along with the cream, to the cider sauce. Gently tip in the mussels, stir gently, then put a lid on and turn up the heat. After 2-3 minutes, remove the lid – the mussels are cooked when they have opened. 6. 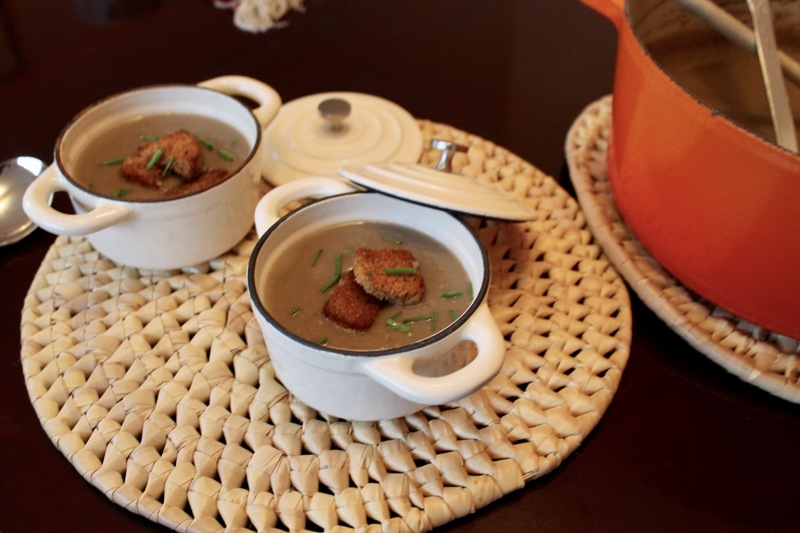 To serve, ladle into bowls and serve with bread on the side. If any mussels haven’t opened during cooking, don’t eat them. 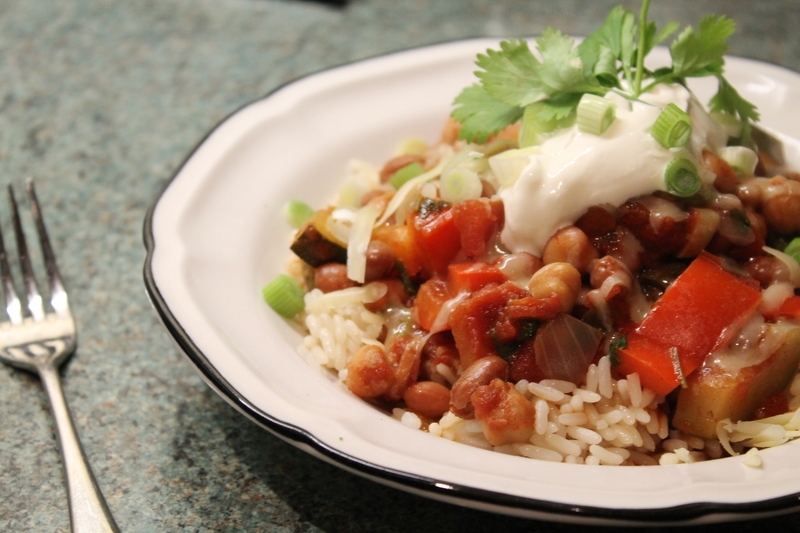 Enjoy this delicious winter warmer! We’re having a New Year’s Eve party tomorrow and so this is an ’empty the fridge to make way for the booze’ recipe. I’ve spent lots of the day in the kitchen preparing the food we’re having tomorrow night, so something quick and uncomplicated was a must. 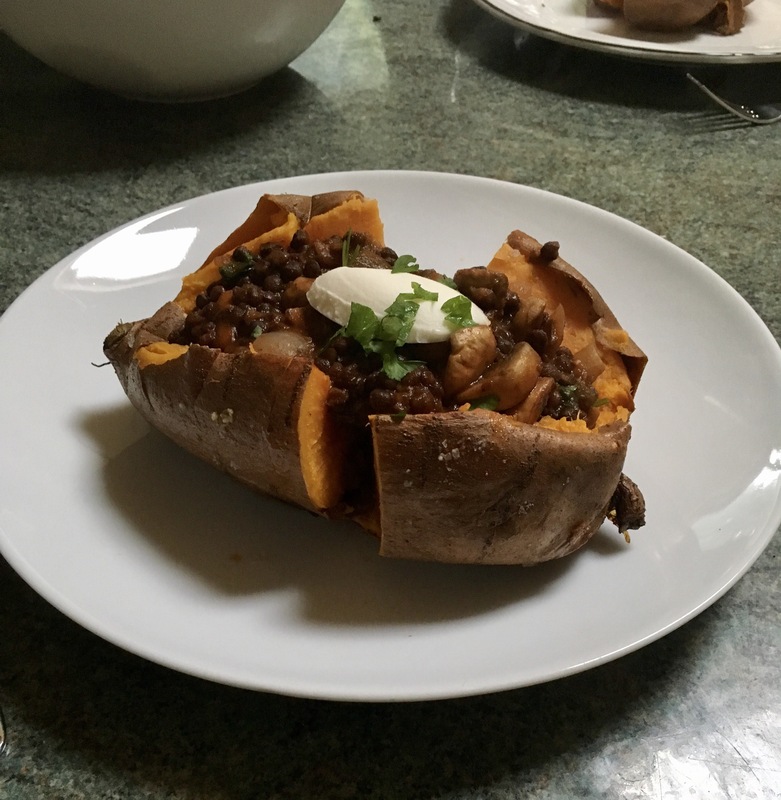 This recipe is so, so straightforward and you can throw in any meat or vegetable you have in your fridge. 1. Boil a pan of water and cook the pasta according to packet instructions. 2. Meanwhile, thinly slice the chorizo and put in a large saute pan over a medium high heat. When it starts to crisp, add the butter. 3. Slice the leek and add this to the pan. When it starts to soften, stir in the creme fraiche and frozen peas. Turn down the heat and allow to cook gently until the peas are cooked. 4. 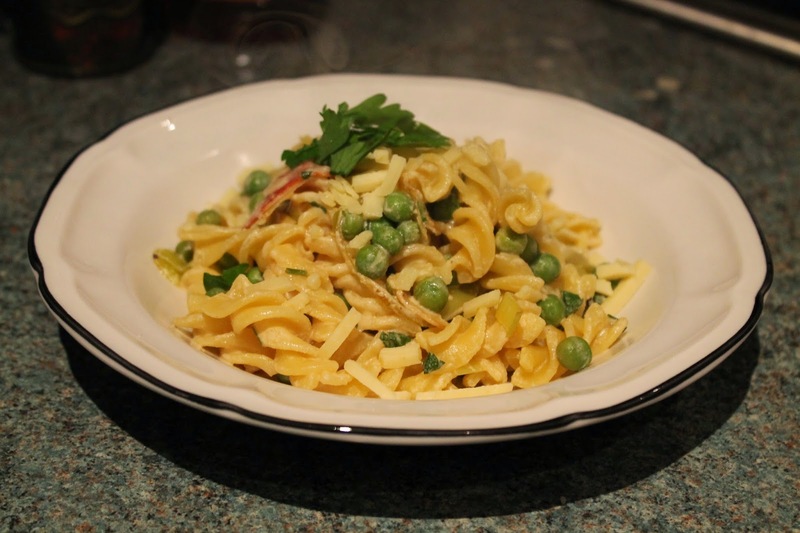 Stir in the chopped parsley and cooked pasta. It’s as easy as that!